The military exploits the visceral appeal of virtual killing. More than that, the Pentagon seeks virtual shooters who have developed surprisingly complex strategic and tactical skills learned through thousands of hours of gaming experience. These skills are like those commanders on the battlefield use in real combat. The U.S. Army Com­bined Arms Center-Training has its own Massively Multiplayer Role Playing Games (MMRPGs) to train new recruits. The system, similar to World of Warcraft, allows in­dividual soldiers around the world to log into the Army MMRPG and play as individuals or as units. Thanks to the great defender of freedom, Edward Snowden, we know about a 2013 NSA Document, “Exploiting Terrorist Use of Games & Vir­tual Environments.” The NSA and the CIA have teamed up with the UK’s Government Communications Headquarters GCHQ to deploy real-life agents into the virtual World of Warcraft and has infiltrated Xbox Live with tens of millions of players worldwide. The world’s two top spy agencies can identify a labyrinth of social networks of those with the inclination for virtual killing. The targets of the espionage may be in Syria or Venezuela; Florida or Texas. In World of Warcraft, players everywhere on earth share the same virtual world, walking, running, travelling around, and killing a variety of computer-generated monsters, along with custom-designed human avatars made by shooters 10,000 miles away. Build your own here! Real and virtual are blurred. SAIC, the defense contractor behemoth, has studied MMORPG’s and concludes they can be used for a variety of purposes by America’s enemies, from recruiting members, training fighters, and spreading propaganda – like the US does with The America’s Armyvideo game. It is ironic to consider the NSA may well have data on both Cruz and Pagourtzis who likely played MMORPG’s. Now, to the mind of Dimitri Pagourtzis, one of 2.2 billion gamers in the virtual universe. Together, the gun groups shown above have more than a million followers. The sites glorify weaponry and use slogans like, “Feeding your Addiction,” “Gun Addict Approved,” We love guns,” and “Guns – I love guns – It’s as simple as that.” 2nd Amendment rights reign supreme, while few challenge the notion that children should be exposed to these sites. The image of the arcade game uploaded by Dimitri showed the first-person shooter game Silent Scope which brings to virtual life the sniper experience. It has several competitors in the virtual sniper market, although it receives high ratings. 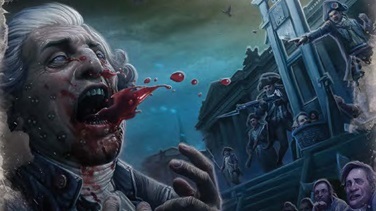 The game depicts the President of the U.S., his wife, and daughter, who are kidnapped by bad guys, calling on Dimitri the sniper to save the nation. 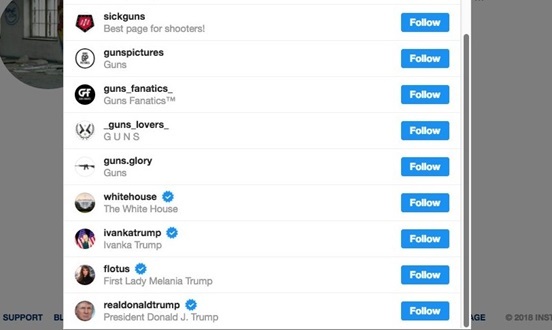 Nine of the Instagram accounts Dimitri followed were fan pages for firearms. The four others included the official accounts for the White House, President Donald Trump, Ivanka Trump and Melania Trump. Dimitri lived in a fantasy world of presidents and demons and avatars. Dimitiri also lived in a real world of principals and parents and unrequited love. They’re too easy to confuse in a teenage mind. Fantasy and reality become garbled. We need a new word, Oxford! How about “fantareal”? Dimitri killed thousands and he was a virtual hero. (Adam Lanza, the Newton shooter, racked up 83,000 kills.) The virtual killing kept Demitri’s mind off his social status at school and the emotional trauma of rejection by a pretty girl. He hated her for it and he wished her dead, along with her terrorist co-conspirators. He could take them all out with a brilliant strategy and carefully chosen tactics. High schools can be vicious places. Lt. Col. Dave Grossman offers a chilling indictment of violent vid­eo games in a widely circulated article, A Case Study: Paducah, Kentucky, published in the fall of 2000. 14-year-old Michael Carneal fired eight rounds in fast succession at a high school youth prayer group, killing three and wounding five. The U.S. is unlikely to move in the direction of classifying gaming disorder as a disease. After all, the US video gaming industry is a $36 Billion business. It’s how things roll in America these days. The gaming industry has twice the revenue of the gun industry, which has successfully resisted common sense measures to ban assault weapons. The American Psychiatric Association has been studying “internet gaming disorder” since 2013, but there’s been no call to action. Rather than seriously examining mental health issues like video gaming as root causes of mass killings, American policymakers are content to concentrate on strengthening some background checks and eliminating bump stocks. It’s tough to know what “duster” means. Dimitri? The Hammer & Sickle, Rising Sun, and Iron Cross are commonplace in the edgy world of latent, psychopathic teens, not that many truly comprehend the historical and sociological significance of these powerful symbols. 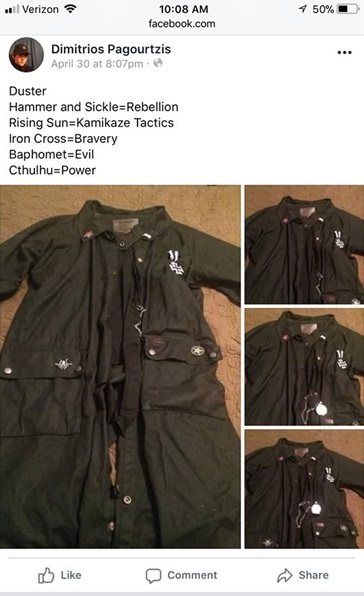 The introduction of Baphomet and Cthulhu are disturbing. 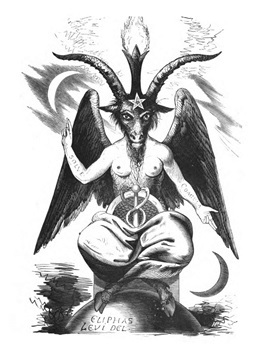 There’s been a fascination of Baphomet since the Crusades. This is most likely how Dimitri viewed Baphomet: He was a god who was worshipped by the Knights Templar, a powerful Catholic military and financial force during the Crusades. The Knights Templar served as wealthy bankers for the church. They set up shop on the Temple Mount in Jerusalem shortly after the Catholic conquest of the city. They exercised great power and influence in Europe until King Philip IV of France (1285-1314) had many captured and tortured. The Templars were systematically burned at the stake. Legend has it that Templars spit on the Cross, denied Christ, and engaged in indecent behavior and idol worship. They were said to have rituals in front of a large idol of the demon Baphomet. The Templars and their deity have become latter-day counter-cultural heroes, the spiritual allies of some of today’s pathetic outcasts in the harshest of social climates – American high schools. Baphomet is part of American culture. Hundreds of Satanists gathered in Detroit in 2015 for an unveiling of a 9-foot bronze statue of Baphomet. The popular and resurgent deity also figured into the plot of the DaVinci Code. 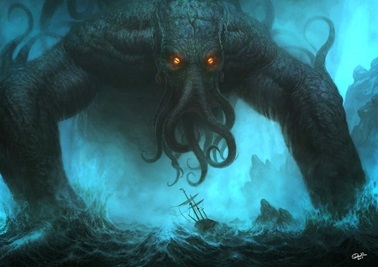 Cthulhu is a gigantic, fearsome alien creature who lurks in the city of R’lyeh deep under the South Pacific. Cthulhu and other beings like him were thought to have ruled the world. His followers around the world await his rise to global dominance. From the popular video game, Call of Cthulhu. Dimitrios Pagourtzis and Nik Cruz are products of American culture. Both were outcasts who took refuge in violent video games and the notion that guns are the great social equalizer because of the way they settle scores. In many minds, Dimitri and Nik have relevance. They’re legitimate because they fought back. These once-obscure nobodies are universally recognized. They are immortal! They’ll hit replay in the abyss for eternity. The boys are great American heroes and valiant warriors in the struggle against persecution and rejection. They have performed necessary heroic tasks. They’re playing their part in an end-of-time diabolical scheme to strike back at the imperial fortress of the dungeons and dragons of the imperial American high school and teenage experience. Their actions are applauded by legions who are emboldened by their brave deeds. Nothing really matters. Human life is cheap. Paybacks are hell. Get out of the way. Game Over. Michael Carneal, the 14-year-old who fired upon a group of 8 praying class­mates at Heath High School in West Paducah, KY played video games all day. Nehemiah Griego, killed five, including his mother, father and small children in New Mexico. He loved playing violent video games. “I’ve been waiting to do this for years.” said Chris Harper-Mercer, the Umpqua, Oregon shooter, before he killed 10 people, including himself. He lived in a fantasy world of violent gaming. James Holmes killed 12 people and injured 70 others at a Century movie theatre. He played first-person shooter games, especially, World of Warcraft. “It’s what he did,” said those who knew him. Kip Kinkel, the Thurston High School shooter who killed four and wounded 25, was an avid gamer. Dylan Klebold and Eric Harris, the murderers in the Columbine High School massacre, were addicted gamers. In the video Harris and Klebold made, Harris says the shooting will “be like [expletive] Doom” and shortly thereafter describes his sawed-off shotgun as being “straight out of Doom.” Doom is an extraordinarily violent first-person shooter game. The U.S. Marines appreciated the extraordinary power of the game. 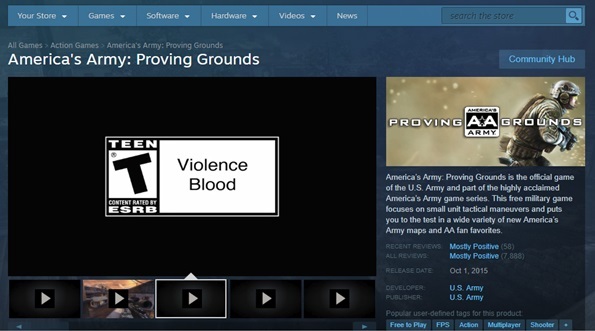 Marines were encouraged to play it, and it was sanctioned to be installed on government PCs. Adam Lanza, the Newtown shooter was an avid gamer. Adam notched up 22,000 ‘head shots’ using violent games to train himself for his massacre. Jared Lee Loughner killed six and injured 13, including Rep. Gabby Giffords. “All he did was play video games and play music,” said those who knew him. In 2003 Devin Moore, an Alabama teen, who shot three officers, spent much of his life playing first person-shooter games. “Life is a video game,” he said after his arrest. Jose Reyes was the 12-year-old who opened fire at Sparks Middle School in Nevada, killing a teacher and wounding two students before turning the gun on himself. He had played violent video games for months before the shooting. Elliot Rodger, the Isla Vista, CA shooter, killed seven, including himself. He admitted he was addicted to violent gaming and played World of Warcraft. Jacob Tyler Roberts, the Clackamas Oregon shooter, was an avid gamer. Dylann Storm Roof, The Charlestown Church shooter who killed nine, dropped out of school to spend his time playing violent video games. Jeff Weise, the Red Lake, MN shooter, shot dead nine people at and near his high school. He followed a video game-like script in his massacre. Nik Cruz and Dimitrios Pagourtzis join the virtual shooter hall of fame.